124, Schools, Lake Grove, class photo. Mrs. Hargreaves. Front row: Charlotte Smith; Bill Sweeney; Louise Brelin; Terry Houdek; David Lowder; Patsy Gross; Marcy Bouscher; Heather Johnson; Dewey Olson; Evelyn _. 2nd Row: Joyce Mathiot; Dickie _; Stephen Doane; Linda Sundholm; Bob. Kilpatrick; Carol Ann Church; David Schindler; Linda Kay Mahaney; Earnie [Ernie ?] McCoy. 3rd row - back: Michael Ball; Larry Anderson; Robert Ernst; Steven Gray; Billy Wridge; Billy Plother; Steven Hess; Marilyn Whitmore; Ellen Glenn. [stamp]: Mr. & Mrs. J.B. McNeil, Commercial Photographers, 8623 S.E. 11th Ave, Portland 2, Oregon. 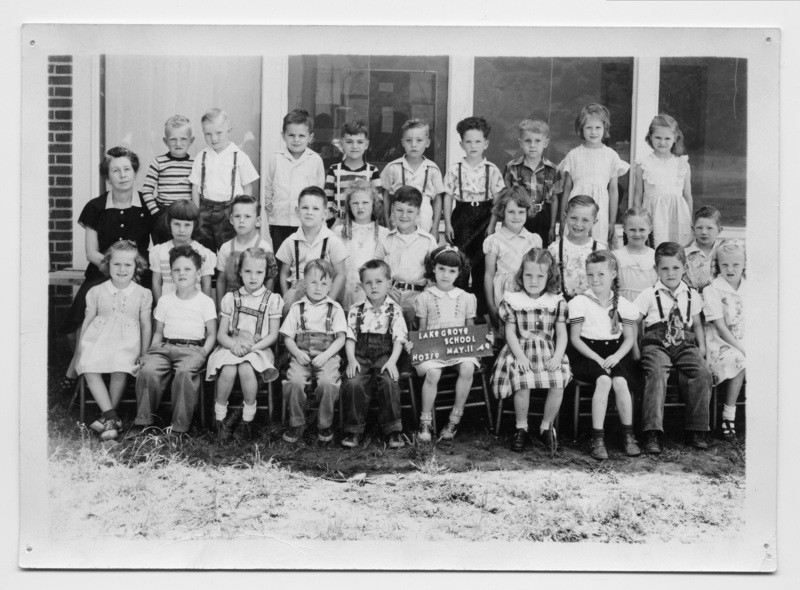 Transcription 124, Schools, Lake Grove, class photo. Mrs. Hargreaves. Front row: Charlotte Smith; Bill Sweeney; Louise Brelin; Terry Houdek; David Lowder; Patsy Gross; Marcy Bouscher; Heather Johnson; Dewey Olson; Evelyn _. 2nd Row: Joyce Mathiot; Dickie _; Stephen Doane; Linda Sundholm; Bob. Kilpatrick; Carol Ann Church; David Schindler; Linda Kay Mahaney; Earnie [Ernie ?] McCoy. 3rd row - back: Michael Ball; Larry Anderson; Robert Ernst; Steven Gray; Billy Wridge; Billy Plother; Steven Hess; Marilyn Whitmore; Ellen Glenn. [stamp]: Mr. & Mrs. J.B. McNeil, Commercial Photographers, 8623 S.E. 11th Ave, Portland 2, Oregon.